In this Photoshop tutorial, we'll learn how to resize, optimize and save photos for uploading to a website or emailing to family or friends using a combination of the Image Size and Save For Web & Devices commands in Photoshop CS5! This tutorial is also fully compatible with Photoshop CS4. Go to Image > Duplicate. Click OK to accept the default name. A copy of the original document appears in a new window. Go to Layer > Flatten Image. The Layers panel showing the flattened image. This opens the Image Size dialog box. As we'll see shortly, Photoshop's Save For Web & Devices dialog box also gives us the option to resize the image, but you'll get better results if you resize your image beforehand using the Image Size command. The current width and height, in pixels, of the image. Generally speaking, for email and web viewing, you want to limit the dimensions of your photo to no larger than 800 pixels by 600 pixels, meaning that the width should not exceed 800 pixels and the height should not exceed 600 pixels. If you're uploading the photo to a website, the website may have other, specific dimensions you need to stick to, but typically, keeping the size within 800 px by 600 px will allow most people to view the image on their screen comfortably. Make sure the first three options are checked and that the bottom option is set to Bicubic Sharper. With Constrain Proportions selected, all we need to enter is a new width or height and Photoshop will enter the other one for us. Notice that I made no changes to the Resolution value in the Document Size section of the dialog box. That's because resolution determines how large an image will print on paper and has nothing to do with viewing an image on a computer screen. All we need to focus on when resizing an image for display onscreen is the actual pixel dimensions of the image, found in the appropriately-named Pixel Dimensions section at the top of the dialog box. Once you've entered your new dimensions, click OK in the top right corner of the dialog box to close out of it, at which point Photoshop will downsample the image to its new smaller size. Go to File > Save For Web & Devices. The preview area is set to the Optimized view mode by default. Switching to the 2-Up view mode. 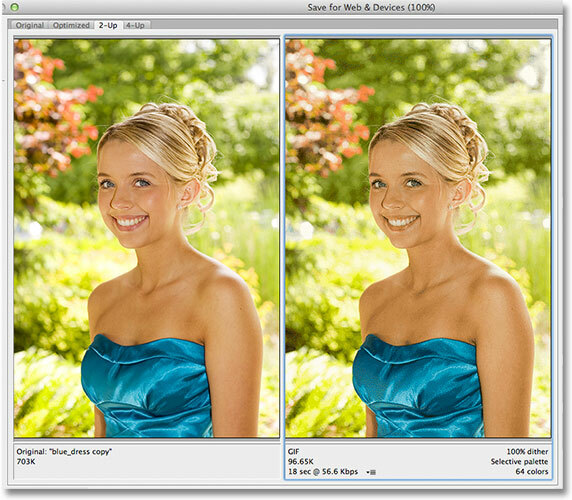 The original version is on the left, the optimized version on the right. Set the file format to JPEG. 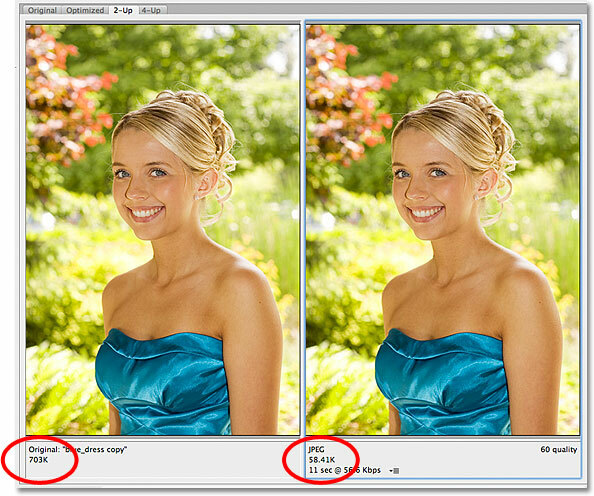 Choose the High quality preset, which sets the Quality value to 60. Choose Optimized, and leave Progressive and Embed Color Profile unchecked. The Convert to sRGB option keeps the colors in your photos from looking dull and drab on other people's computer screens. The Image Size options in the bottom right of the dialog box. 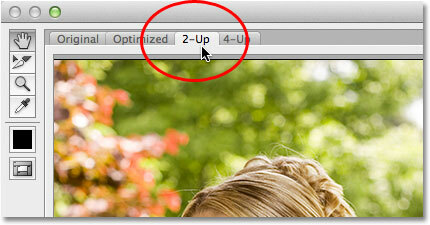 The 2-Up view lets us compare file sizes between the original and optimized versions of the image. The Save Optimized As dialog box. And there we have it! The photo is now resized and fully optimized, ready to be emailed to friends and family members or uploaded to the web, thanks to the Image Size and Save For Web & Devices commands in Photoshop CS5!